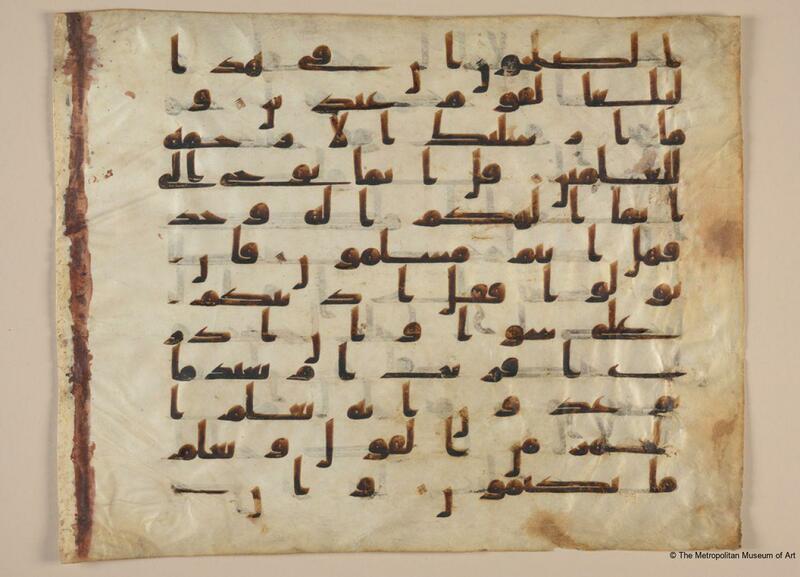 This folio, monumental in size, comes from one of the oldest surviving Qur’an manuscripts in existence. 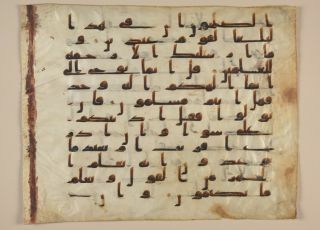 Its kufic script displays some similarities with the earlier ma’il (leaning) script, including the form of the vowel ya’ in the terminal position whose tail wraps around to underline the preceding letters. 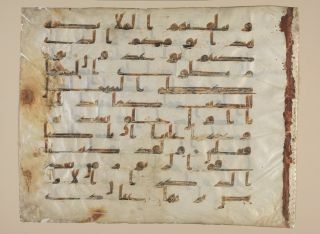 Based on the form of the script and the illuminations that survive on other pages from this Qur’an, the manuscript has been attributed to Cairo, Egypt; Damascus, Syria; or San‘a’, Yemen. About one third of the original manuscript is housed in the Hast-Imam Library in Tashkent, Uzbekistan. Coran coufique de Samarcand, écrit d’après la tradition de la propre main du troisième calife Osman (644–656) qui se trouve dans la Bibliothèque Impériale Publique de St. Petersbourg, St. Petersberg, 1905. Ekhtiar, Maryam, Canby, Sheila R., Haidar, Navina and Soucek, Priscilla P. (eds), Masterpieces from the Department of Islamic Art in The Metropolitan Museum of Art, New York: The Metropolitan Museum of Art, 2011: 25–26, no. 1, ill. 25 (colour). Fendall, Ramsey, Islamic Calligraphy, London: Fogg, 2003: 12. George, Alain, The Rise of Islamic Calligraphy, London: Saqi, 2010: 87–88. Piotrovsky, Mikhail, Earthly Beauty, Heavenly Art: Art of Islam, Amsterdam: Lund Humphries Publishers, 2001: 101–4. 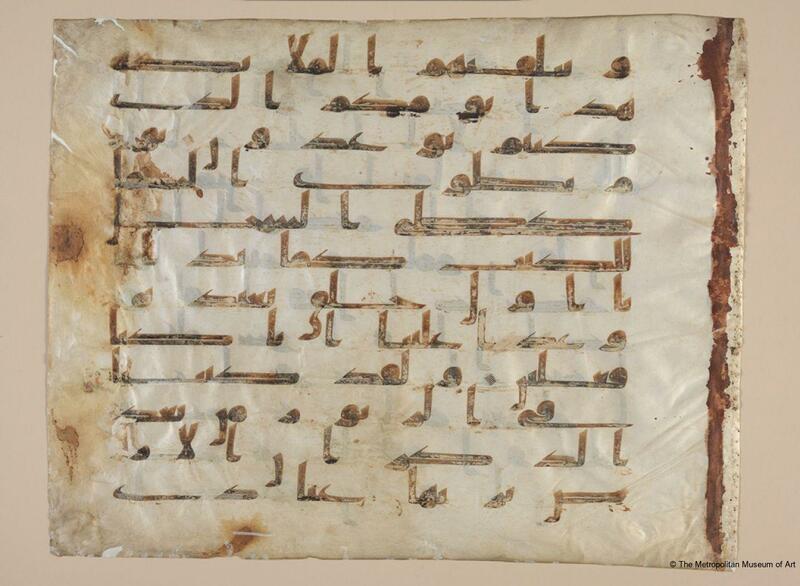 Raby, Julian (ed), The Nasser D. Khalili Collection of Islamic Art. The Abbasid Tradition: Qur'ans of the Eighth to the Tenth Centuries A.D., London: Nour Foundation, 1992: 27–33.